The Arizona Wildcats finally beat the UCLA Bruins on Saturday, defeating them for the first time in the Rich Rodriguez era. The Wildcats won 47-30, and were led by Khalil Tate who put up video-game numbers in his first start of the season. Here were some takeaways from the game. Our full recap can be found here. I can’t speak for everyone, but Saturday’s game was the first time I was excited to watch Arizona football since, probably, UA’s 2015 game against UCLA when it hosted College GameDay. Of course, most of that excitement stems from Khalil Tate, who proved that last Saturday’s record-breaking performance vs. Colorado wasn’t exactly a fluke. And did you know that he now leads Arizona in rushing? Well, he does. Needless to say at this point, but Tate’s athleticism and arm talent make him such an electrifying quarterback. Other UA quarterbacks like Brandon Dawkins and Jerrard Randall were capable of breaking any run for a touchdown, but neither of them ever displayed the type of touch or pocket presence that Tate does. I mean, just look at this pass. How do you not get excited when Tate drops back knowing he can do this regularly? Tate has made Arizona’s offense an absolute joy to watch and wildly effective. Meanwhile, UA’s defense — though prone to its fair share of struggles — has several promising players of its own and is doing just enough to keep Arizona in games. Junior cornerback Jace Whittaker picked off Josh Rosen twice, and has become a very solid and reliable player. True freshman Kylan Wilborn had four sacks and a forced fumble vs. UCLA, continuing to establish himself as one of the top playmakers on the team. Freshmen linebackers Tony Fields II and Colin Schooler have been solid all year, too. Arizona’s 2017 recruiting class is evidently a good one, making the future of Arizona football much brighter than it was just 12 months ago (and Rodriguez’s hot seat cooler?). And the crazy part is the present outlook of this team isn’t exactly dim, either. Aside from maybe the game at USC, every remaining contest on UA’s schedule appears to be winnable right now. The Wildcats are in second place in the Pac-12 South with a 2-1 conference record, and it wouldn’t be surprising to see them win seven games at this point as they’re already 4-2. After that disastrous outing against Utah, would you have ever thought that was possible? I sure wouldn’t have. There weren’t many weak points in Arizona’s win over UCLA, but the kicking game was definitely a glaring one. Jake Glatting had three punts for just 94 yards (31.3 average), and Josh Pollackmissed an extra point and a 28-yard field goal. It wouldn’t be surprising to see Rodriguez try to find a different option at punter, since Glatting’s issues weren’t a one-time thing. The junior was averaging just 38.3 yards per punt entering Saturday’s game. Pollack could be an option there, as he did double duty last season. On field goals/extra points, it seems the issue is with the snaps. At least, that seemed to be the case on Pollack’s 28-yarder that went wide left. Arizona has had several field goals blocked this season, all of which happened after long snapper Nick Reinhardt tore his ACL. And not just ones that Pollack kicked, either. Lucas Havrisik had his field goal attempt blocked vs. Utah, so it doesn’t appear to be a kicker problem. It’s a snapper problem. The good news is tight end Trevor Wood took over at long snapper late in the game vs. UCLA, and Pollack didn’t miss afterwards. Whether or not Wood is the long-term solution there remains to be seen, but it’s clear Arizona has an issue at that position, and it needs to get it figured out. The Wildcats got burned by leaving points on the field against Utah and Houston, and it’s bound to cost them again if it’s not solved. Perhaps overshadowed by Tate’s excellence was Nick Wilson’s performance vs. UCLA. The senior running back had 22 carries for 135 yards and two touchdowns, easily his best game of the season. His previous high was 87 yards on eight carries against lowly NAU. The oft-injured Wilson was dealing with ankle sprain earlier in the season, but looked as spry as ever against UCLA. He was quick. He was agile. He was flat-out trucking dudes. Wilson’s inability to stay healthy has been well-documented, but when he’s on the field, there’s no doubt he’s a force to be reckoned with, and someone who can elevate UA’s offense to a higher level. And now he has a quarterback who has to be accounted for as a passer in Tate. Thus, more running room. “Everyone focuses on him so it’s pretty simple and straightforward for us running backs,” Wilson said. 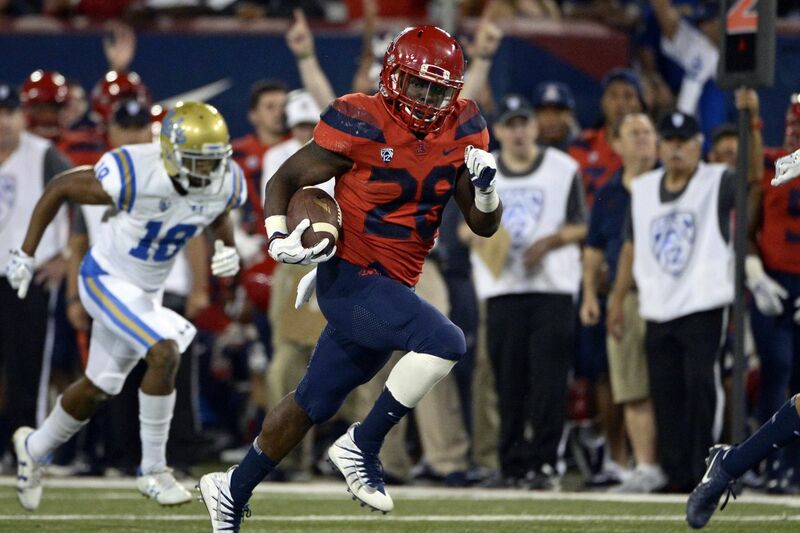 Another overlooked aspect of Arizona’s win vs. UCLA was the depth it displayed on defense. Luca Bruno was out with a concussion, Parker Zellers got ejected for targeting, Scottie Young Jr. exited early with an injury, and Whittaker and Justin Belknapboth got banged up during the game. Yet, Arizona’s defense actually got better as the game progressed, allowing just over 100 yards in the second half. Kwesi Mashack in particular made a positive impact, taking over for Young at free safety. He had two tackles for loss and a pass breakup. 15 different Wildcats recorded two or more tackles against the Bruins. “It seems like defensively we have been losing guys to injuries but we did what we had to do,” Rodriguez said. The one weird thing about Arizona’s defense is that its pass rush is not as impressive as its sack numbers would lead you to believe. Arizona has had nine sacks in its last two games, but Rodriguez voiced his displeasure about the lack of pressure on the opposing QB after both games. Rosen did throw three interceptions against Arizona, but none of them were thrown while under pressure. They were just head-scratching decisions. And last week, Colorado QB Steven Montez put up some pretty big numbers against the Wildcats. Sacks are obviously good, but a consistent pass rush would be better.